Bristol City moved four points clear at the top of League One with a comfortable victory over Port Vale. Jay Emmanuel-Thomas put City ahead in the first half when he fired in off the underside of the bar from 25 yards out. Joe Bryan's shot deflected off Freddie Veseli and looped over Chris Neal for 2-0 and Matt Smith capitalised on a poor back-pass to slot home the third. Mark Marshall grabbed a consolation for Vale on 77 minutes with a low shot under goalkeeper Frank Fielding. The visitors had a late flurry of chances, with Aden Flint having to clear off the line from Michael O'Connor, but City held out. Steve Cotterill's side have now gone seven games unbeaten in the league and have a five-point cushion in the automatic promotion spots. Port Vale dropped to 16th but are only six points off the play-offs in a congested table. "At times we played some very good football and at other times we were a bit sloppy. "We were disappointed to concede a goal. At 3-0 we switched off a little bit. "I knew this sort of performance would happen tonight, after MK Dons. "After every big game it's difficult to get the lads back up. But I'm really pleased with the way we manoeuvred our way to three points." Match ends, Bristol City 3, Port Vale 1. Second Half ends, Bristol City 3, Port Vale 1. Attempt saved. Tom Pope (Port Vale) header from very close range is saved in the centre of the goal. Foul by Korey Smith (Bristol City). Tom Pope (Port Vale) wins a free kick in the attacking half. Luke Ayling (Bristol City) wins a free kick in the defensive half. Foul by Michael O'Connor (Port Vale). Attempt blocked. Chris Lines (Port Vale) right footed shot from the centre of the box is blocked. Attempt saved. Tom Pope (Port Vale) left footed shot from the left side of the box is saved in the centre of the goal. Substitution, Bristol City. Kieran Agard replaces Matt Smith. 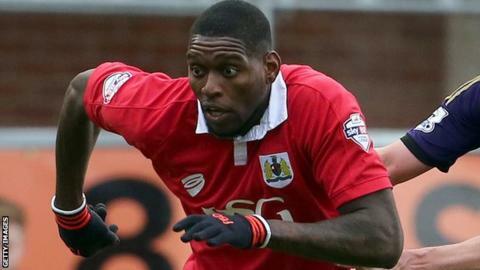 Jay Emmanuel-Thomas (Bristol City) hits the right post with a right footed shot from outside the box. Hand ball by Matt Smith (Bristol City). Corner, Bristol City. Conceded by Frederic Veseli. Greg Cunningham (Bristol City) wins a free kick in the attacking half. Foul by Tom Pope (Port Vale). Goal! Bristol City 3, Port Vale 1. Mark Marshall (Port Vale) right footed shot from the centre of the box to the centre of the goal. Substitution, Bristol City. Marlon Pack replaces Wade Elliott. Corner, Port Vale. Conceded by Luke Ayling. Foul by Wade Elliott (Bristol City). Michael O'Connor (Port Vale) wins a free kick in the defensive half. Substitution, Bristol City. Greg Cunningham replaces Derrick Williams. Substitution, Port Vale. Byron Moore replaces Chris Birchall. Goal! Bristol City 3, Port Vale 0. Matt Smith (Bristol City) left footed shot from the centre of the box to the centre of the goal. Attempt saved. Wade Elliott (Bristol City) left footed shot from the left side of the box is saved in the centre of the goal. Greg Luer (Port Vale) wins a free kick in the defensive half. Foul by Luke Ayling (Bristol City). Attempt saved. Matt Smith (Bristol City) right footed shot from the right side of the box is saved in the bottom right corner. Substitution, Port Vale. Chris Lines replaces Michael Brown. Substitution, Port Vale. Greg Luer replaces Achille Campion. Goal! Bristol City 2, Port Vale 0. Joe Bryan (Bristol City) right footed shot from outside the box to the top right corner. Assisted by Matt Smith. Attempt missed. Matt Smith (Bristol City) header from very close range is close, but misses to the right following a corner. Corner, Bristol City. Conceded by Tom Pope. Corner, Bristol City. Conceded by Chris Neal. Attempt saved. Luke Freeman (Bristol City) left footed shot from outside the box is saved in the top centre of the goal. Corner, Port Vale. Conceded by Frank Fielding. Attempt saved. Mark Marshall (Port Vale) right footed shot from outside the box is saved in the bottom left corner. Korey Smith (Bristol City) wins a free kick in the defensive half. Foul by Michael Brown (Port Vale). Second Half begins Bristol City 1, Port Vale 0. First Half ends, Bristol City 1, Port Vale 0.